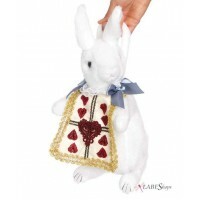 Charming Alice in Wonderland is all dressed up for a perfectly fun Halloween. This pretty costume set has a ruffle trimmed apron dress with large bow accent and matching bow headband. Item Number: LA-c83773 | Approximate Size (Inches): 10.00 wide x 2.00 deep x 14.00 high | Approximate Shipping Weight: 2.00 lbs.